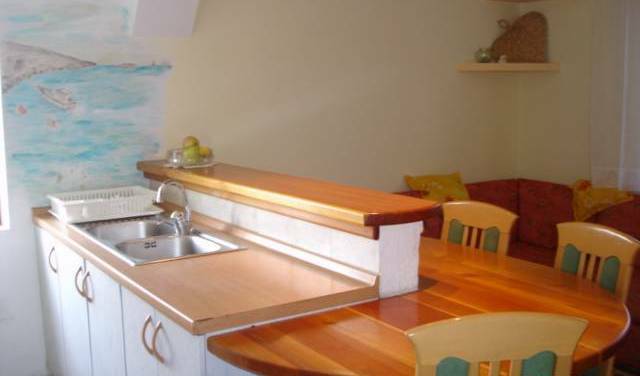 Vacation Žut is just 10 meters from the sea. We offer two apartments. Nalazimo se u blizini centra i plave plaze, što poguduje obiteljima sa dijecom, mladima, i starijima. Iznajmljujemo pet apartmana. Svaki apartman ima balkon ili terasu. Opremljeni sa klimom, wi-fi priključak, i parking je osiguran. 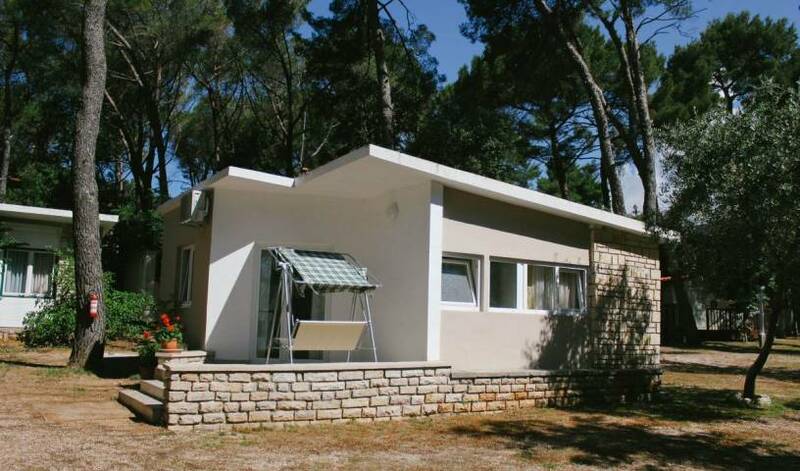 Autocamp in the midlle of Adriatic coast, 700 meters from the centre of the city of Biograd. Besides the area for classical camping our guests can choose an excellent accomodation in apartments as well in modern mobile houses. MOBILE HOUSE STANDARD (5. 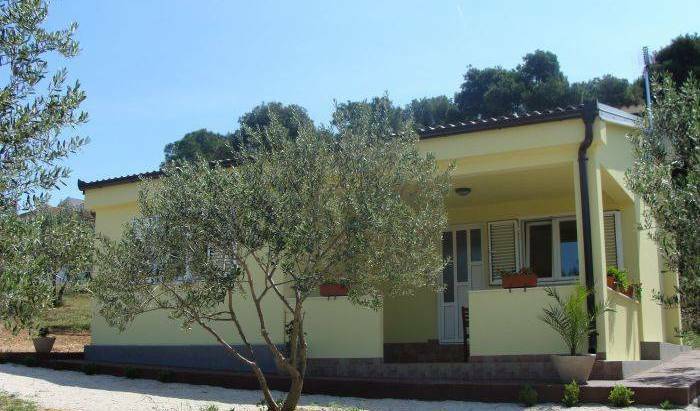 60x3m) for 3-4 people includes: a living room with a kitchenette and a sitting set, a room with a French bed for 2 persons, a room with two separate French beds, a shower and a toilet, air conditioning, a 9 m2 terrace with extendable awning and a sitting set. 1-BEDROOM APARTMENT (40 m2) is located on the first floor of the central building and has one bedroom with a queen bed, and in the living-cooking area a retractable sofa bed for 2 persons, a bathroom, an 8 m2 balcony, air conditioning, a SAT / TV. A parking space next to the house. 2-BEDROOM APARTMENT (6×7 m) for 4-5 people includes: a living room with a kitchenette and a couch for one person, two rooms with a double bed for 2 persons, a SAT / TV and air conditioning, a shower and a toilet, a 9 m2 terrace with a sitting set. A parking space next to the house. MOBILE HOUSE SUPERLUX (8x4m) for 4 people includes: a living room with a kitchenette and a sitting set, a room with a French bed for 2 persons, a room with two single beds, a separate shower and a separate toilet, a SAT / TV and air conditioning, a 9 m2 terrace with extendable awning and a sitting set. A parking space next to the house. 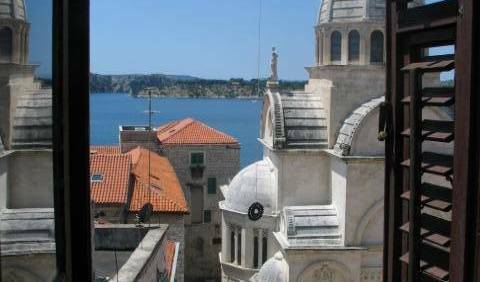 Accommodation in the center of Šibenik, Johnny`s place, an apartment with a an area of 157 m2, situated on one of the floors of an old building constructed of stone with a view of St. James` cathedral and its square and the sea behind it. The apartment is suitable for the accommodation of several persons or it can be an ideal place for an individual seeking quite and creative ambience (atelier, working space). The apartment is in the immediate vicinity of many monuments of high cultural and historical value – St. James` cathedral, Town Hall, Sacral art museum in St. Barbara`s church, Bishop Palace, Wells of Šibenik, St. Ann`s fortress and the Mediterranean gardens near the church and monastery of St. Lawrence. Situated in Sibeniks old town only 50 metres from the famous St. Jacob's Cathedral, Accommodation Lacky offers functionally furnished rooms and an apartment with air condition, satelite TV and free Wi-fi. Deluxe double room with double bed and sofa bed, sitting area, private bathroom, air conditioning, LCD satellite TV, fridge and Wi-Fi access. This air-conditioned studio comprises a double bed and a sofa bed, a kitchenette and a private bathroom. An LCD satellite TV is featured and free Wi-fi. The family owned business offers a house with stylishly furnished apartments suited for 1 to 6 people, placed in the city centre. In our comfortable apartments you will find a modern and carefully selected furniture. This amazing villa offers you a new renovated modern, elegant rooms with smart tv, air condition and mini bar..
APARTAMENT ANA offers you accommodation in our family house apartments. Appartments in the centre of Sukosan. Experience the typical Dalmatian atmosphere with us. 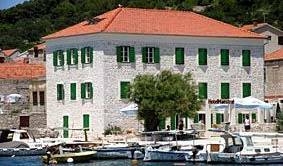 The Apartments Jermen are situated in peaceful touristic town Sukošan, only 10 meters away from the beach and 10 km from the Old Town of Zadar. The tastefully designed Apartments Jermen have terrace, SAT TV, kitchen, bathroom. DAMA" appartments are graded "three stars appartments", by the Croatian Touristic Office. Family M hostel is modern accommodation facilities situated only 1. 5 km from major historical and cultural sights of the ancient city of Zadar, 400 m from a public beach and Kolovare promenade, and only 100 m from the city'smain bus station. A new, charming hotel offering modern accommodation and friendly atmosphere. Cozy and comfortable rooms with air conditioning. Very calm area only 2, 2 km to the city center. Taking care of special needs of the guests. Very comfortable, spacious and modernly decorated room with two single beds. The room is air-conditioned, non-smoking and has its own elegant, spacious bathroom. The room has a balcony. The room is also equipped with the flat screen TV, tablet, satellite television, telephone, hairdryer, safe, desk, well-assorted minibar and all the stuff one needs for a good stay. There is an access to the Internet in the room. Very comfortable, spacious and modernly decorated room with the double bed. The room is air-conditioned, non-smoking and has a balcony – perfect for enjoying delicious breakfast or sunbathing. It has its own spacious bathroom. The room is also equipped with the flat screen TV, tablet, satellite television, telephone, hairdryer, safe, desk, well-assorted minibar and all the stuff one needs for a good stay. There is an access to the Internet in the room. Very comfortable, spacious and modernly decorated room with the double bed. The room is air-conditioned, non-smoking and has its own elegant, spacious bathroom. The room has a very big, 40m2 balcony with the beautiful sea view – perfect for enjoying delicious breakfast or sunbathing. The room is also equipped with the satellite television, telephone, hairdryer, safe, desk and all the stuff one needs for a good stay. There is an access to the Internet in the room. 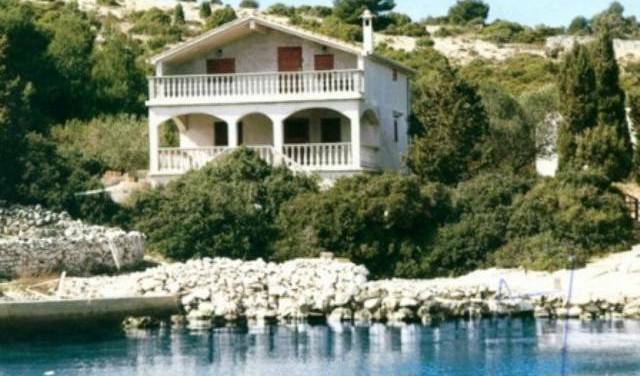 2 luxury apartments in Zadar - Croatia located in quite place nearby sea suitable for families and business people.